The model results are in agreement with experimental data in tyre manufacturing, where hundreds of actual installations of such non-contact systems are successfully increasing tyre production speeds by optimising the vulcanising time to the initial conductions of the green tyre. The method is extended to any thermal process and examples for food processing, printing and laminating are given. A common problem in thermal processing during production is the lack of control of the initial condition of the materials to be processed. For example, the storage of materials could be in a cold or hot warehouse, the temperature may vary depending on the climate and season; it could have just been delivered by truck and there is no certainty as to bulk temperature; or the materials may have come from another process in the same plant, where the time it has been at room ambient is unknown. Referring to Figure 1 it can be seen that if the initial bulk temperature were known, the total time in an oven could be reduced by increasing conveying speed and adjusting oven temperature distribution. Without this temperature information, the oven time must be sufficiently long to accommodate the worst case initial condition. For non-metal, the surface temperature alone, which can be obtained with infrared sensing devices, is not sufficient due to the large gradient from the material surface to the interior. Accordingly, a more sophisticated technique is required which is based on easily measured variables, yet is robust enough to be used in real-world factory conditions. A specific application for tyre vulcanising was actually researched and installed at a major tyre manufacturer. The process for tyre vulcanising is similar to the process illustrated in Figure 1, expect that it is not continuous. Tyres are ‘cooked’ under heat and pressure in special moulds, one at a time, in individual presses. By measuring the ‘green’ tyre temperature immediately prior to vulcanising, press time could be adjusted to maximise throughput. This in turn increases plant capacity with almost no capital investment – a significant accomplishment compared to adding capacity to a $100 M plant conventionally. Initial experimental work immediately indicated that employing surface temperature alone would result in unacceptable errors. Accordingly a method was proposed that solved a simple steady-state heat balance equation at the tyre surface, and thus could provide the internal temperature with a simple non-contact device. This method is described in Figure 2. IR thermocouples with a heat balance circuit were constructed and calibrated to the correct ‘K’ value as per Figure 2. 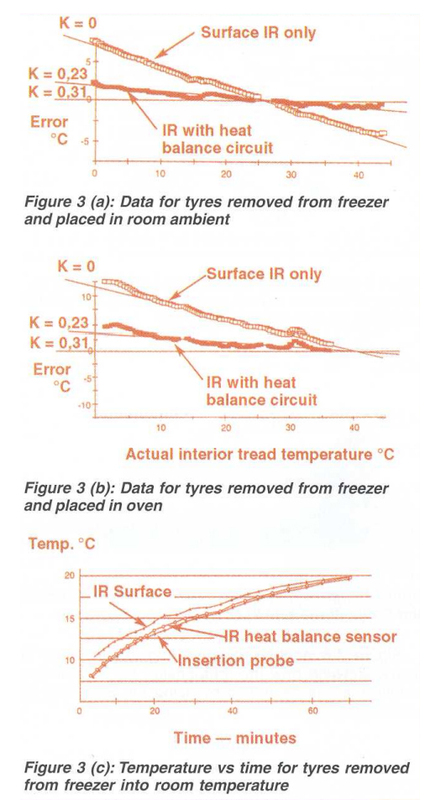 These were installed in the tyre plant (see Figure 3) with very good tracking of actual internal temperatures. Hundreds of tyre presses were placed under the control of this method, and for seven years they have produced with excellent results, increasing throughput by about 10%. This is especially effective in the summer when green tyres are warmed by storage in hot warehouses prior to vulcanising. Despite the success, the underlying analysis was largely empirical, with no theoretical support for the simple steady-state model, and thus there was considerable uncertainty as to whether the method may be applied to other processes, or even to other tyre manufacturing plants. Accordingly, a more complete analytical model was required to provide the design parameters necessary for successful applications, and to minimise the time and cost of empirical investigations in actual plants. - The coefficients emerge with conventional dimensionless heat transfer groups: the Fourier No (Fo) characteristic heat conduction time, and Biot No (Bi) ratio of surface transfer rate to conduction. 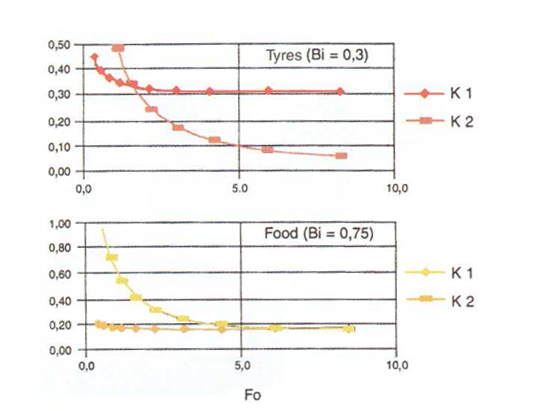 Figure 4 shows the variation of K2, K1 with Fo at the Bi calculated for the thermally processed tyres, and for comparison to feed. Note that the experimental value K – 0.31 is directly predicted. Results of this analysis can be used to develop the speed boost equation (SBE) which can then be used as a control algorithm to maintain correctly balanced thermal input to produce consistent product temperature profiles from the surface to the center, at various speeds, V. for large speeds changes, for example >10%, material and heat transfer characteristics may become non-linear, and thus require re-normalisation of the value of K2/K1 at more than one point until the final desired speed is reached. The physical interpretation of the SBE is that the ratio of energy supplied by the heat source at T∞ to the product with surface temperature Ts, divided by the energy level difference between the initial state TO and final state Ts is to be held constant, and the speed is held constant, the initial and source temperatures must be controlled to maintain the balance in the SBE. 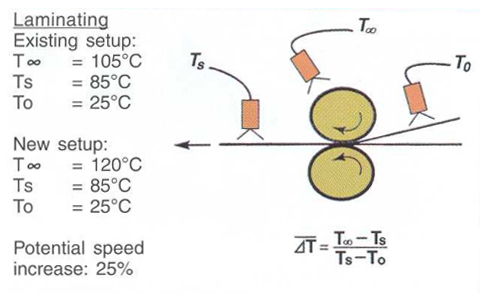 Applying the SBE to laminating processes, as illustrated in Figure 5, a 25% speed increase may be realised by increasing the heating roll temperature from 105 to 120oC, holding all else constant. The same increase could be achieved by providing preheat to 48oC without changing the source temperature. 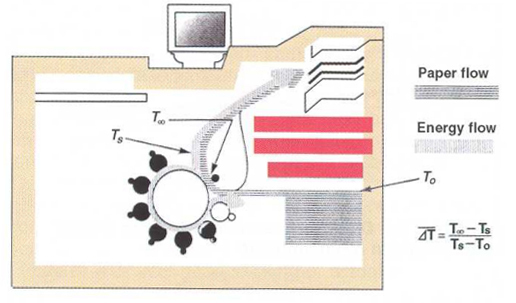 Figure 6 shows an example of a high speed colour copier which has as the heat source the fuser roll temperature. The product temperature is the copy itself and the initial temperature is the feed paper. Inks for colour copies are particularly temperature sensitive due to the strong viscosity dependence on temperature. Here accurate control is very important in order to maintain quality at maximum possible speed (a highly competitive selling point for manufacturers). Applying the SBE with appropriate IR sensors allows maximal speeds under all conditions, especially if a preheat stage is fitted to the design. Figure 7 is another example from the graphics industry, showing how the temporising roll in waterless printing may be controlled by using the SBE with the appropriate sensors. 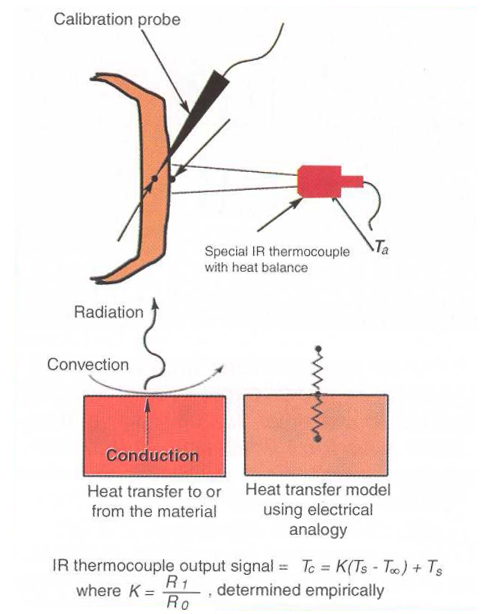 Employing IR sensing to accurately control thermal processing, especially to increase process speeds, must include provisions for the difference between the surface temperature, which can be directly measured, and the bulk material temperature, which must be indirectly measured. 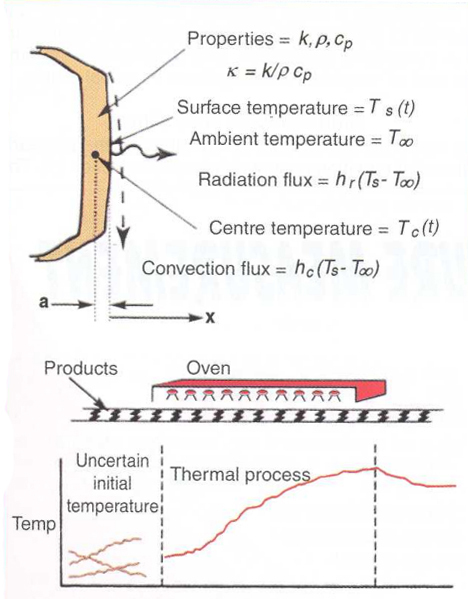 By employing a simple result of a complex mathematical model, the bulk temperature can be estimated from surface temperatures, ambient temperature, material properties and speed. By extending the model, a result we call the SBE can be directly employed with appropriate IR sensors to increase production speeds while maintaining material temperature characteristics.